Bill was born and raised in New York. When he was 12 years old he was involved in a car accident which resulted in the amputation of his right leg. As a child Bill had dreams of playing professional hockey; raising the Stanley cup and getting into the Hockey Hall of Fame but unfortunately after the accident Bill had to put these dreams on hold. However, his love for ice hockey endured and eventually he was able to try out for Team USA’s standing amputee division and has been playing for them ever since! Today, Bill lives in Las Vegas, working in the events sector and playing ice hockey during his spare time. Bill has been happily wearing Blatchford products for over 20 years and currently wears an Echelon hydraulic ankle for his day to day activities and then when he hits the ice he wears a Javelin blade; lightweight and ideal for moderate impact sports and activities. Bill had always longed for a foot which offers great stability to help reduce the number of falls he had on the ice. When Bill was first introduced to Javelin he found it provided him with exceptional stability on the ice, Bill comments “It’s amazing, I am able to pivot on my back foot a lot better than before”. Javelin has helped bill to be the best he can on the ice and achieve his dreams, giving him much more lateral movement meaning he doesn’t fall down as much. Even his team mates have noticed a difference, saying he’s faster and more stable. 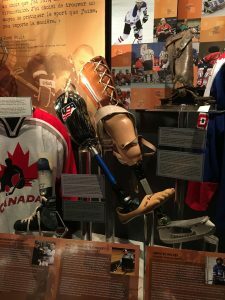 As of August 2017, Bill’s 2001 team accomplishment of getting into the Hockey Hall of Fame became realised with his first Blatchford foot now sitting pride of place as an official artefact forever in the Hall of Fame to Bill’s delight. Looking to the future Bill wants to continue playing ice hockey and sharing his inspiring story of achieving his dreams.